Gerald Cooper won an individual Bronze medal in the World Advanced Aerobatic Championships in 2003 and graduated to the National Unlimited Aerobatic Team in 2004. Since then, Gerald has represented the UK at the highest levels of aerobatic competition. Gerald became British National Aerobatic Champion in 2009 and has not been beaten in domestic competition since. In 2012, Gerald flew as part of the British team at the European Aerobatic Championships becoming the first British Pilot to win a Gold Medal in a major unlimited aerobatics competition and become European Unlimited Aerobatic Champion. The 2012 British Helicopter Teamachieved a Silver medal at the FAI World Helicopter Championships in Drakino, Russia. The top placed British crews consisted of David Monks & Caroline Gough-Cooper (who were awarded a Silver medal in the precision flying event), Andrew Taee & Mike Buckland and John Jackson & Craig Finch. Quentin Smith also took a joint Gold medal position in the Individual Freestyle Event. The nucleus of the current team has been together for 7 years and strives constantly to progress and improve with the aim of challenging the Russian Team who have dominated the event since its inception in 1974. 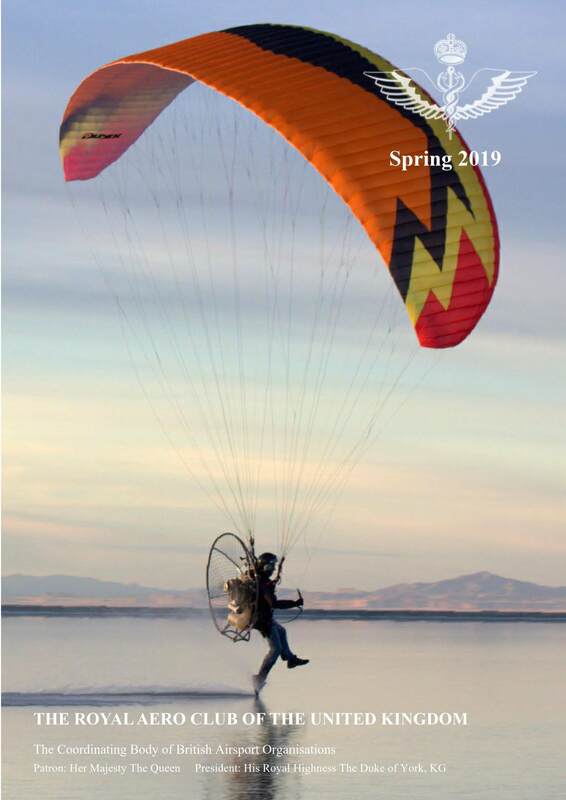 Mike Mold joined the then Popular Flying Association in 1977 and was a founding member of the Devon Strut where he currently serves as Newsletter Editor and Webmaster. Thanks to Mike’s efforts, the Devon Strut has become the largest within the Light Aircraft Association. Mike has also served for many years on the LAA’s National Council and served on a steering committee preparing an updated set of governance documents for LAA Clubs and has assisted many of them in getting local support. Mike was nominated for this award in recognition of his support of recreational flying in the Southwest over many years. Joan Walsh has been a microlight instructor for the last 10 years, resisting the temptation to use sophisticated aircraft and remaining true to microlighting’s raison d’être – flying at minimum cost. Her calm, no nonsense approach to instruction has proved to be very effective. Joan has also been a pioneer in the use of flight simulation to enhance her students training. She has a background in IT and has developed her own fully functioning flight simulator which she has integrated into her training programme. Joan has also served on the BMAA Council where her calm, no nonsense approach (and experience as a magistrate) has been of significant value. Never one to look for the limelight, her devoted service to the BMAA leaves microlighting very much in her debt. Andy Oliver has been a flexwing pilot for more than 10 years, during which time he has contributed greatly to microlighting both at national and club level. He has carried out a great many long distance tours of the UK and Europe and has encourage others to do the same by writing about his exploits in Microlight Flying magazine under his nom de plume ‘The Journeyman Balladeer’. He has led tours of less experience pilots around France and has organised and led fly-outs in the UK to encourage less experience pilots to ‘stretch their wings’. Andy has also served as Chairman of his local club, the Devon and Somerset Microlights, restructuring their finances and preparing plans for a permanent clubhouse. He is an excellent ambassador for UK sport aviation in general and microlighting in particular. Phil Ball has been an active competition model aircraft flyer since his youth and is one of only three people to have represented Great Britain in all three outdoor free flight classes at World or European Championships, in the course of which he has been a member of three F1C medal winning teams. Phil has also been National Senior Champion no less than 19 times, competing in all outdoor free flight classes, both domestic and FAI. On one occasion during a fly-off, his Open Rubber Model was timed for over 88 minutes, the longest single flight in any British contest. Phil has also served on the BMFA Midland Area Committee and the Free Flight Technical Committee and has been involved in the promotion of his branch of the sport at the BMFA ‘Power Nationals’. He has also been a regular contributor to the modelling press and has presented several technical papers at the annual Free Flight Forum. Norman Burr has been an editor of Microlight Flying (and its predecessor Flightline) for no less than 30 years. He originally took over the production of Flightline in 1982 when it was an A5 format produced bi-monthly on a photocopier. Originally produced at home with the help of his first wife Wendy, he set up his own company - Pagefast, to produce the magazine more professionally and for 13 years was involved with every stage of production from editing to publishing and printing. Norman has overseen the expansion of the magazine which is now a full colour 52 page A4 monthly publication. Norman has remained an integral part of the editing team and remains consulting editor. Norman has made a significant contribution to the development of microlighting as a responsible part of sport aviation. When Peter Gorman and Essam Bishara left Newcastle, Ireland in Peter’s homebuilt Vans RV6 on October 19th 2011, they were uncertain whether their destination of Cape Town was attainable. Despite many months of planning, undertaking a flight to South Africa in a light aircraft is fraught with problems of war, civil unrest and logistics. Their journey across Europe and down the eastern side of Africa reads like a ‘Boy’s Own’ adventure. Technical and Logistical problems were overcome through their tenacity, perseverance and above all patience. They arrived at Stellenbosch Airfield, South Afirca on 20th November after 63 hours flying time. Less than two weeks later, they headed north for home and another incident packed adventure, arriving safely back in Ireland on the 20th January. The challenges of such flights may be different to those of the pioneering pilots of the early twentieth century, but they continue to demand high levels of expertise and skill from those with the ambition and daring to undertake them. Andrew Perkins has worked tirelessly over many years developing and driving forward numerous successful initiatives on behalf of youth and aviation. Andrew is an accomplished pilot, flying solo in gliders at 16 and then rising through the volunteer ranks to become CFI at one of the country’s largest gliding clubs at Wycombe Air Park. At 22, he became the youngest Examiner for the BGA and was Champion during the 2005 UK Junior National Gliding Championships. Now as a senior First Officer for British Airways, his focus has turned towards helping others, particularly the young and underprivileged achieve their dreams in aviation. Andrew’s current voluntary roles include – Director and Trustee of The Air League, Director of the BGA - leading the youth gliding initiative, Trustee of the Phillip Wills Trust - supporting gliding club development, the Battle Back Charity – for injured servicemen, and the Inner City Young People’s Need initiative to facilitate access to flying for underprivileged young people. When time permits, Andrew is a volunteer instructor at Bicester Gliding Centre where he resides as one of the Thames Valley Region Examiners. Brian Hope joined the then PFA in February 1985 after reading an article about a homebuilt aircraft in a D.I.Y. magazine. He took flying lessons and soon became the proud owner of a small Jodel light aircraft which he still owns and operates today. He is one of the tutors for beginners participating in the Mid-Kent Struts regular cross Channel flights. He has served on the LAA’s Executive Committee, including time as Association Treasurer and Vice-Chairman before becoming full time editor of both the magazine and website. Since Brian became editor of the magazine in January 1995, it has gone from a thin bi-monthly publication to a substantial, high quality monthly magazine, considered one of the major jewels in the LAA’s crown. He remains a major contributor to the magazine and whenever practical flies to report on European events in his Jodel, sleeping in a tent under the wing. When the LAA’s Rallies were suspended Brian joined the small team which successfully resurrected them. Brian is an aviator’s aviator, completely dedicated to recreational flying. Johnny Carr was one of the early participants sport of Hang Gliding in the 1970’s and has been one of the UK’s leading pilots competing and setting records for 4 decades. In 1975 he broke the British endurance record for prone flight on a Hiway 260 at Rhossili. He has been a pioneer involved in many new developments in Hang Gliding and class 2 gliders in particular. He was one of the original members of the British league in 1977 when he came second in the very first British National League competition. He has since represented the UK in many international competitions and in 2012 led the British class 1 cross country league and was ranked in the top 10 in the British open series. In May 2012, he set a new UK Class 1 out and return record of 108 Km from his home site at Devils Dyke. Johnny continues to be an active and widely respected competitor at all levels of UK Hang Gliding competition. The Royal Aeronautical Society launched the Centennial Scholarship Fund in 2003 to provide financial support to the next generation of aerospace pioneers. Through the Centennial Fund, the Royal Aeronautical Society has generously provided crucial financial support of the RAeC Trust’s “Flying for Youth” programme for a decade. The Flying for Youth programme provides bursaries to support the development of young pilots in all disciplines. Since its launch, the Flying for Youth programme has with the invaluable assistance of the Society gone from strength to strength. For example, it granted 28 bursaries in 2012 targeting disadvantaged young people as well as other applicants. The success of the Trusts Flying for Youth programme is due in no small part to the on-going financial support of the Royal Aeronautical Society which has been a mainstay of the programme which remains undiminished despite the current difficult financial climate. Nick Buckenham joined the BAeA as a newly competitive aerobatic pilot in 1989, serving as Chairman between 1991 and 1999. Nick was a member of the British Advanced Aerobatic Team from 1997 to 2001, winning a Team Bronze at the Europeans in 1999 and placing fourth in the team results at the World Championships in 2000. He was British Advanced Aerobatic Champion in 1997. From 2006 to 2012 Nick became Head of Contest Organisation for the BAeA. After the turn of the millennium, Nick moved from flying to judging and developed a new computer scoring system which has now become standard in most countries around the world. Nick also progressed to being an International Judge and was elected Chief Judge for the European Championships in 2012. He was also invited to judge at the US National Championships. For the last decade Nick has travelled widely within Europe running judging seminars and training events in an effort to improve judging standards. Nick has served for several years on the Judging Sub-Committee of CIVA and in 2011 became the UK Delegate to CIVA and was elected to the Board as one of its three Vice-Presidents. David Monks was Team Captain of the British Helicopter Team which returned from the 2012 FAI World Helicopter Championships in Drakino, Russia with a team silver medal. David and his co-pilot Caroline Gough-Cooper also won a silver medal in the Precision Flying event with 294 points scored from a maximum of 300. The 2012 result is largely a result of many hours invested by David in coaching and developing crews to compete effectively at world class level and the results have been achieved through a considerable amount of preparation & planning for weekend long training events and from ensuring that crews participate in both UK and European national events. He has also used the training events to actively encourage and coach newcomers, establishing a legacy for the succession of a new team in the future. David is the only non-professional pilot to have won (outright) the British Helicopter Championship. He is a Director of the HCGB and is the UK delegate to the FAI Rotorcraft Commission, responsible for overseeing & developing competition rules for international rotorcraft events. David plans to continue to representing Great Britain at future international competitions. The BMFA F1C (free flight power) team of Neil Allen, Alan Jack and Ken Faux, with Mike Woodhouse as Team manager, won a Team gold medal at the European Free Flight Championships, Capannori, Italy during August 2012. In almost perfect conditions the UK team turned in the perfect result, a perfect score. However this was not without the few obligatory heart stopping moments. Ken Faux had a fly away in round 6 and the model was not found until the next day 18 kilometres away from the launch site. On the last flight of the contest the timekeepers gave Alan Jack an engine over-run. A protest to The Jury had the flight declared legal. As a result the UK tied with Russia. A deciding fly off was held at sunrise the next morning in which the UK demolished the Russian team to take team gold. The first PFA’s annual Rally was held in 1957 at Sywell aerodrome. By the 1980s it had become a major national and international general aviation event. However, costs rose with success and by 2005 the Association was forced to suspend the event. This left a gaping hole in the GA calendar and the Rally was sorely missed by members. However, Ian Harrison, Brian Hope, Nigel Ramsay and Penny Sharpe were determined to resurrect it in an affordable form. They sought the help of Mike Bletsoe-Brown of Sywell Aerodrome and the Rally resumed in 2010. The LAA Rally would not have happened without the perseverance, enthusiasm and energetic efforts of Penny, Ian, Brian and Nigel, and the co-operation and support of Michael and it is a measure of their effectiveness that it has so quickly re-established itself as a major international GA event. Eric Marsh started flying in 1976 in his early 30s and has been a member of BAeA since 1985. He has amassed over 1000 hours in command and has owned and built many aircraft including two Socata Tobago’s, a Slingsby Firefly, a Piper Cherokee, two Skybolts and three Vans (an RV4, an RV6 and an RV8). For many years Eric competed in Standard level aerobatic contests and although he never achieved a win, he reached the runner up slot on numerous occasions, including second place in his Skybolt in the 1988 Tiger Trophy. Eric has served the BAeA for over 27 years in a number of volunteer posts including a spell as Vice Chairman in the 1990’s. He is a very experienced Contest Director and has won the BAeA Contest Director of the Year on several occasions. In addition Eric has taken responsibility for the custody, distribution and preservation of the Association's trophies for these many years. Mike Grove started building glider winches in 1989 and in the intervening years has been instrumental in transforming glider winch launching in Britain and in many other gliding nations. Mike’s winch designs have combined the best of traditional construction with innovation. His company, Skylaunch, has continued to innovate and exports its products worldwide. The key features that Mike has incorporated into his winches focus on excellent performance and greater reliability. This has resulted in a higher launch rate due to fewer cable tangles and also improved safety due to fewer launch failures, better protection from moving parts and effective cable guillotines. Mikes winches incorporate simple controls making them easy to operate and they are supported in use by a professional & experienced team. Mike continues to provide guidance and advice to clubs on winch launching. His combined passion, drive, engineering skills, success and as a consequence contribution to the safety of winch launching are worthy of recognition. Bill Sharp has been a BPA Rigger Examiner since 1994 and is a regular, reasoned and fair contributor to the BPA Riggers Committee. His lack of commercial bias is notable and he is quick to spot anomalies between proposals, ethics and the BPA regulations. He was the full-time rigger for the British Army Joint Services Parachute Centre at the Rhine Army Parachute Association (RAPA), Bad Lippspringe, Germany, for over 20 years as well as a BPA Advanced Instructor Examiner. Since 2003 Bill has been running Rigging Courses at RAPA and has run 12 courses to date. He has qualified 32 Basic Riggers, 34 Parachute Riggers, 5 Advanced Riggers, and 3 Rigger Examiners for the BPA. All of this was done for the benefit of the BPA with no financial consideration being taken by Bill for his own efforts. Bill’s purely selfless high focus approach has therefore produced more than half of the current BPA riggers and raised the overall standards of both BPA rigging and rigging courses. Chris Tompkins started aeromodelling in 1946 while still at school. For almost 30 years he held the position of Treasurer for the BMFASouth Midlands Areaand prior to this he was Area Competition Secretary for a year. He has also played a major part in establishing the British Association of RadioControl Soarersas a special interest group within the BMFA. He was BARCS member No. 4 and held the position of BARCS Chairman for 14 years from 1975 to 1989. He also served as BARCS President from 1996-1999. For the first ever F3J World Championships held in 1998at Upton-on-Seven, he served as one of the Deputy Event Directors and also designed and produced the F3J World Championship Trophy which is still awarded today. He is currently Chairman of the FACCT (First All Country Competition Team) Cluband member of the Western-on-the-Green club where he is still on the rota to mow the grass strip. Bob Littledale has held a PPL since he was 21 years old and joined the PFA in 2001, having retired from the post of Finance Director of CSE Aviation. He responded to an appeal from the Association for help with financial advice in 2006, becoming its Treasurer the same year. He retains that post today but in 2007 added the duties of Company Secretary. He has sole responsibility for the detailed oversight of LAA finances which produces a large workload before and during audits and during budget setting. The Association has the greatest confidence in his good advice and judgement and the huge amount of work he does both as Treasurer and Company Secretary. He still manages to find time to fly his own light aircraft and answer the host of questions the Board members’ ideas and proposals generate. Anne Burgess has given a great deal to gliding in Scotland. She must be one of the longest serving treasurers anywhere in the UK having reached her 27th consecutive year in the position with the Highland Gliding Club. Without her wise guidance over the years, it is unlikely the club would be in the position it is in now. In addition to her club activities, she was instrumental in setting up the Scottish Gliding Association and in turn gained the lottery funding to purchase one of the first high performance, two seat ASH 25's in the UK. She can also be found ruling Competition Control with an iron first at the UK Mountain Soaring Championships every year. Anne may not have a UK wide profile, but ask anyone at a Scottish Club who she is and most will have heard of her. Anne thoroughly deserves recognition for her unstinting and meritorious support to gliding over decades of service. Wing Commander Dawn Lindsey was seconded to the Civil Aviation Authority (CAA) to act as the CAA focal point for Olympics’ airspace preparations. In the course of planning it quickly became apparent that the potential impact on Civil Aviation, including the sport and recreational sectors, could be very significant. Listening to the points raised in consultation, Dawn assisted in modifying the proposals so that security could be maintained while the impact on general aviation could be minimised. With genuine enthusiasm and vigour, and from a standing start, Dawn established an unprecedented level of engagement, communication and trust between the various groupings within the general aviation community, Departments of State and security services. This resulted in Olympics Airspace Control measures that enabled a degree of freedom and flexibility for General Aviation which many thought impossible. Gary Connery made history on 23 May 2012, when he jumped from a helicopter at 2,200 feet over Henley-on-Thames and landed on a stack of cardboard boxes without opening a parachute. He wore a wingsuit, commonly used by skydivers to extend freefall time and fly around the sky, however nobody had ever landed one. Gary is not just a skydiver and BASE jumper, but also a stunt man (he was the parachuting double for the Queen at the Olympic opening ceremony!). However even using the wingsuit to slow his descent, he would still be travelling at a potentially unsurvivable speed. Gary made four practice jumps, opening a parachute each time to check that his accuracy would be perfect. Once he committed to the jump, he had to be absolutely sure of hitting the target as there would be no chance to open a parachute at the last moment. Gary passed the point of no return and a cheer went up as he hit the boxes, followed immediately by silence as everyone waited for confirmation that he was all right. He calmly walked out from between the boxes, kissed his wife, and took his place in history. Dominic Bareford had an early introduction to ballooning when his father flew him from the maternity hospital shortly after his birth in July 1993. Since then Dominic has crewed for and flown many times with his father and various other pilots both in the UK and other countries around the world. He obtained his PPL for balloons shortly after his 17th birthday in 2010 and has steadily gained experience as P1. In 2011 he extended his experience in ballooning by becoming an observer for competition flights. In September 2012, with just over 40 hours as P1 in balloons Dominic competed in his first ever British National Hot Air Balloon Championship and was placed second. This qualifies him for a place at the next European Championship where he will probably be the youngest ever pilot (20) to compete in this event. Marling School successfully bid to be the lead school for one of the Royal Aeronautical Society’s Boeing build-a-plane projects in 2009. For the last 3 years the student bodies of Marling, Stroud High and Maidenhill Schools have supported the project with great enthusiasm. Whilst many students have made valuable contributions to the project a small number of individuals have especially impressed the volunteer supervisors with their application and cheerful persistence, remaining enthusiastic under sometimes difficult and discouraging working conditions and through occasional set-backs. It is largely due to commitment of this keen core of nascent engineers that the aircraft has now been completed and is, at the time of writing, waiting approval for flight testing. Wing Commander Ken Wallis was born 26th April 1916. He served with distinction in RAF Bomber Command during World War II but is better known in the aviation world for his autogyro designs, flying and records, of which he holds 34. Indeed, he’s well known even beyond light aviation circles because of his enthusiasm for aviation and his willingness to share that enthusiasm with anyone who shows an interest. At the time this citation was written he was believed to still be flying his beloved autogyros at the age of 96. Ian Seager is a dedicated pilot who publishes a magazine on light aviation, rather than a publisher who is keen on flying. His enthusiasm spills over into his magazine and into all he does to further the interests of General Aviation. In August of 2012 he flew his own aircraft, a Cessna 182, from the UK via Iceland and Greenland to Wisconsin, USA to attend the Experimental Aircraft Association’s AirVenture show at Oshkosh, a Mecca for all light aircraft enthusiasts. Such a flight in a single-engined light aircraft is a serious enterprise even for a professional pilot, but for an amateur it is a momentous undertaking and Ian is to be congratulated for making it. He later published a full and fascinating account of his flight in the Flyer magazine. Peter and Annabel Jarvis (aka ‘The Bedford Cavalry’) have provided support and help to their local microlight community above and beyond the call of duty. Day to day they lead The Bedford Microlight Club, but their help and support goes far beyond this. Chris and Kay Bradford flew to Sandy late in 2011, and a very heavy landing resulted in a u/s aircraft. Peter and Annabel offered the Bradfords every assistance including accommodating them, providing space in a hangar for their damaged aircraft and taking them to the train station. In the summer of 2012 they came to the rescue of Rob Kraike who found himself in adverse weather in France on the way back from the Blois trade show forcing him to deploy his ballistic parachute, landing in a forest. Rob contacted the Jarvises who were on their way back from Blois by road. They took a 200 mile diversion to return Rob and his damaged aircraft back to his base. Irvine Laidlaw has made a generous and long standing commitment to help fund the British Helicopter Team over the past 3 world championship events. The financial backing of the British Team is essential in order for the team to be able to compete in international events. Success at international level requires a huge investment to find ways to continually improve on past performance and improve consistency and this involves the team practising in home based training events and competing in European national events. Irvine has made a significant contribution towards financing the cost of competing in such events. At the 2012 World Helicopter Championships in Russia the British Team won the team silver medal - the highest position ever achieved (having achieved a bronze medal placing in 2008). Without the support of key principal sponsors such as Irvine Laidlaw these successes may not have been achieved. Colin Davey started instructing in September 1980, and became the volunteer CFI of Four Counties Gliding Club (4CGC) at RAF Syerston in Oct 2003. Shortly afterwards, the Club moved to RAF Barkston Heath, and then, in 2005, to its present home at RAF Wittering. On both occasions, the Club lost members and instructors who lived too far away from the Club's new location. Each move required Colin to identify and bid for accommodation; re-build the instructor base; rebuild the club membership; and restart the long process of transforming what had suddenly become a largely ab-initio club to an advanced cross-country club. In 2012, Colin handed over the reins as CFI to a planned successor: during his nearly 9-year tenure, over 15,000 launches, most of them instructional flights, were flown without accident. All of this reflects his outstanding commitment to the training and development of pilots at every level, which accords entirely with the spirit of the Ann Welch Memorial Award. Gordon Bellerby was the winner of the Records Racing & Rally Association’s 2012 King’s Cup air race. The King’s Cup air race was first run in 1922 and King George V presented the cup. Whilst the original cup is no longer in the Royal Aero Club’s possession the base remains and the cup which is now presented was first presented by King George VI in 1947. It was the first air race to be run on a handicapped basis, allowing aircraft of all types to compete. Although the handicapping process is now more sophisticated this still remains the case. Gordon, raced to success in his AA5B aircraft, registration number G-BFXW. Gordon Bellerby was the winner of Records Racing & Rally Association’s 2012 Jubilee Trophy which is presented annually to the British Air Racing Championship pilot who scores the highest aggregate points over the whole season. Gordon won the trophy racing his AA5B aircraft, registration number G-BFXW. Carol Cooper gained her PPL in 1984 and became an instructor in 1987. She became a full-time instructor at Andrewsfield where she has worked ever since. She upgraded from AFI to QFI later in 1987 and gained her Seaplane rating in 1988 and MEP Instructor qualification in 1989. By 1990 she was a PPL examiner and started teaching for the CPL. In 1995 she gained her Instrument Rating and by 1997 she became an RT examiner. The following year she gained her FIC qualification and was elevated to FIE (Flight Instructor Examiner) status in 2001. Carol is a stalwart of the AOPA Instructor Committee and was nominated Instructor of the Year in 2007. She is a Liveryman of GAPAN and is a keen supporter of their social side. Carol has taught literally hundreds of PPLs and a large number of FI students, surpassing 20,000 hours in 2010. This is an amazing total of hours for someone who has only flown light aircraft. She has recently become a FECPL, one of very few women to achieve that status. The British Parachute Association (BPA) Jim Crocker Trophy for an Outstanding Contribution to Sport Parachuting has been awarded jointly to husband and wife Dr John & Debbie Carter. Dr John Carter has made some 4,000 sport parachute descents since 1973 and has qualified as an instructor, coach, pilot and pilot examiner. A general medical practitioner by profession, Dr Carter has provided his expertise as a volunteer to the BPA since 1990. He responds to around 300 enquiries annually on fitness to parachute, and has made significant contributions to many BPA committees, working parties and training courses. In doing this, he has played a major part in enhancing the safety of the sport. An accountant by profession, specialising in work with organisations in the voluntary and charitable sector, Debbie Carter has served the BPA in the volunteer capacity of Treasurer for some 20 years. During this time, she has made a significant contribution to the BPA through her sound advice on financial management and systems. Dave Sykes took off in a flexwing microlight from Rufforth airfield in northern England on 28 April 2011 with one goal - Australia. Flying in a P&M Quik, Dave was about to attempt a journey that would take him through 18 different countries and over thousands of miles of water. Few have achieved this feat, but Dave had to overcome physical disability as well as all the other more normal obstacles. Following a road accident in 1993, Dave lost the use of his legs and has since relied on a wheelchair for his daily transport - hence his nickname 'Wheely Dave'. No other paraplegic has ever succeeded in flying from the UK to Australia in a microlight and, to underline the enormity of this achievement, Dave was flying solo. The original plan was 55 days' flying. After sickness, monsoons and bureaucratic delays and, despite being airborne often for 8 hours each day, Dave reached Sydney 119 days after leaving Rufforth. This outstanding achievement is testament to Dave's endurance and stamina and proof that determination can overcome disability. In 1969 Charles Boddington built a replica BE2c biplane for the film “Biggles Sweeps the Skies”. The aircraft was taken to the United States where it was subsequently crashed. In 2004 Stephen Slater and Matthew Boddington, the son of the film replica’s original constructor, became joint owners of the wreck and returned it to the UK, where the airframe and engine were given a complete restoration, starting in March 2005. The steel tube fuselage needed major repairs from the front of the rear cockpit forward. All four wings had to be rebuilt using new spruce spars although a commitment was made to use as many original components as possible commensurate with safety, a decision which inevitably increased the restoration time. The aircraft’s de Havilland Gipsy Major engine, which had been modified to run in an upright configuration, was also fully rebuilt. Assisted by a number of friends, Stephen and Matthew spent six years on the restoration, which led to Matthew making the aircraft’s first post-restoration flight in May 2011. Chris Dunkley became involved in ballooning in the early 1980s. He worked as a commercial balloon pilot and became a BBAC approved Balloon Inspector, a BBAC approved instructor and also a BBAC balloon examiner. Chris also set up his own balloon repair station in the mid 1980’s. In 1996 Chris was heavily involved in the production of the video ‘The Complete Countryside Guide’ aimed at balloon pilots and took a starring role as presenter. This video still remains relevant today. Chris has been responsible for producing a large number of technical & information documents on behalf of the BBAC and has been Chairman of the BBAC Technical Committee since the late 1990’s, managing to convert dry, legalese into a form that is understandable to all. Hugh Browning has expended and continues to expend a vast amount of his time on developing improvements in gliding safety, with a specific focus on the long term analysis of accidents and incidents to gliders within the UK. This ranges from year by year analysis, six year rolling analysis and historical analysis. In 2004 Hugh analysed the 2650 gliding accidents recorded over the previous 16 years. Using this data he was able to determine the predominant causes of fatal and serious accidents. He then led a small team to develop safety initiatives to address those causes. It is clear that his data has been invaluable for the UK and wider gliding community in understanding the effectiveness of subsequent safety initiatives and Hugh has worked tirelessly over the years to reduce the number of fatal and serious gliding accidents. Graham Newby joined the Light Aircraft Association in the late 1970s and has built 3 kit aircraft. He served very successfully as the Association’s first Chief Executive from 1999 to 2008. He handed over his CE role to look after his partner who’d been seriously injured in an aircraft accident, but has continued to give advice and assistance to his successors and has served as the LAA’s representative on an EASA Working Group set up to examine the possibilities for greater proportionality in EASA Regulations which ultimately led to the introduction of the European Light Aircraft 1 (aircraft up to 1200 kg) and ELA2 (aircraft of 1201kg to 2000kg) processes. This Working Group also recommended the introduction of the LSA category in Europe. John Aldridge, a retired army officer, started flying hang gliders in 1984 and went on to fly paragliders at the start of the new millennium. He came to prominence in the free flying world when he became meet director of the British Hang Gliding League in 1995 and continued to give freely of his time and talents to organise and run both the British Nationals and British Open Series competitions for the next 13 years. John served on the British Hang Gliding and Paragliding Executive Board as Competition Director from 1996 to 2011. He was the UK delegate to CIVL for 12 years, head of its Sporting Code Sub-committee for 8 years and the CIVL representative on CASI. John was elected as Vice President of CIVL in 2002 and rose to President at the plenary meeting in 2010. He has served as steward to the jury at many FAI World and European Championships in both disciplines of Hang Gliding and Paragliding since 2000 and was also a council member of the Royal Aero Club from 2005 to 2011. John was awarded the BHPA Presidents Trophy in 2011 for conspicuous service to the sport. In recognition of John’s years of self-less service to the administration of national and international hang gliding and paragliding, he was appointed as an FAI Companion of Honour at the 2012 FAI General Conference. Dr Peter Saundby served as a Royal Air Force medical officer from 1957 until 1991, retiring with the rank of Air Commodore. Peter has held a private pilots licence since 1953 and has been a glider pilot since 1960. During this time his extensive range of RAF posts included Group Medical Officer for the RAF’s Central Flying School, Flying Personnel Medical Officer Near East and Middle East, Senior Medical Officer at Fairford during the trial flights for Concorde, Commanding the RAF Institute of Hygiene and Training, Commanding the RAF Hospital Wegberg and serving as Assistant Surgeon General at the Ministry of Defence. Peter became Medical Adviser to the BGA in 1967, a role which he fulfils to this day. He has also served as UK delegate to the Medical Commission of the FAI since 1985, becoming President in 2005. He became Medical Co-ordinator for Europe Air Sports in 1993 and served on their Board from 1999 until 2005. Peter was appointed as an FAI Companion of Honour at the 2012 FAI General Conference, in recognition of his long and dedicated service to medical aspects of airsport and his work as past-president of the FAI Medico-Physiological Commission.